Software is available, which simulates all basic electrophoretic systems, including moving boundary electrophoresis, zone electrophoresis, ITP, IEF and EKC, and their combinations under almost exactly the same conditions used in the laboratory. These dynamic models are based upon equations derived from the transport concepts such as electromigration, diffusion, electroosmosis and imposed hydrodynamic buffer flow that are applied to user-specified initial distributions of analytes and electrolytes. They are able to predict the evolution of electrolyte systems together with associated properties such as pH and conductivity profiles and are as such the most versatile tool to explore the fundamentals of electrokinetic separations and analyses. 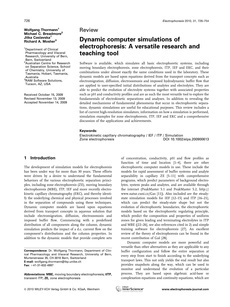 In addition to revealing the detailed mechanisms of fundamental phenomena that occur in electrophoretic separations, dynamic simulations are useful for educational purposes. This review includes a list of current high-resolution simulators, information on how a simulation is performed, simulation examples for zone electrophoresis, ITP, IEF and EKC and a comprehensive discussion of the applications and achievements.